Some people appear to be happy-go-lucky on the outside, but they struggle desperately behind closed doors and never give the matter much thought as to why. They distract themselves with TV, or social media, or whatever it takes to drown out the pain and the truth about their unhappiness. Other people make lavish, life-long plans based on what they have been told “should” make them happy: “I’m going to marry the perfect man/woman, we’re going to buy our dream house and a couple cars, and we’re going to raise our children in the suburbs.” But then they wake up ten years into their plan feeling unfulfilled and depressed. Can you relate at all? I certainly can. Many of us suffer in similar ways. As long as we’re busy doing whatever it is that distracts us from the truth – the whole truth about our happiness and ourselves – we go through life like stones tumbling aimlessly down a mountainside. We bounce and react impulsively to the surrounding environment, and we blunder onward with no clear idea as to where we’re headed or why. We awake every morning wishing we could sleep in. Then we begin each day’s work with the foremost intention to stop working as soon as feasibly possible. Our minds grow numb to the monotony of a comfortable yet draining routine. And somewhere along the line, as each day fades into the next, we get our house (sometimes a really big one) and cars (sometimes really fancy ones), and we start a family under pressure… and we never stop to question it all until we feel empty inside, often a decade or two later… as our smiles continue to betray the sadness that we refuse to speak of, and perhaps don’t even fully know we carry. This is how many of us live our lives – in a state of denial. We deny the truth about how unhappy we are. We deny the truth about how distracted we are. We deny the truth about how little time and effort we put into the things that matter most to us. And so it goes. But the good news is, we can change. All of us can. We often choose to focus on the wrong things – the things that do NOT make us happy. – Here’s a universal law of happiness and success: What you pay attention to grows! So focus on what truly matters, let go of what does not, and feel the genuine, positive power that flows from your decision to rise above all the drama and petty distractions. Our expectations tend to get in the way of otherwise good days. – On a daily basis, wouldn’t you rather be pleasantly surprised than hopelessly disappointed? You can be. A big part of your immediate contentment relies on your willingness to let go of what you assumed your life is supposed to be like right now and openly appreciate it for everything that it is. Most of what worries us today has absolutely nothing to do with today. – If you worry too much about what might be or what might have been, you will ignore and totally miss what is. Worry is the greatest opposition to the present moment. It does nothing but steal your joy and keep you incredibly busy doing absolutely nothing worthwhile at all. Old wounds have nothing to do with the present potential for happiness. – Do your best to let GO! And remember, letting go isn’t about having the ability to forget the past – it’s about having the wisdom and strength to embrace the present. You have a choice, to be positive and free or to be imprisoned by your own negativity – to live in the past or to be mindful about the present. It isn’t what happens, but how we respond that makes us or breaks us. – Being happy and positive does not mean ignoring the negative – being happy and positive means overcoming the negative. There is a big difference between the two. Truly, the biggest and most complex obstacle you will ever have to overcome is your mind. If you can overcome that, you can overcome anything. The draw of short-term comfort often robs us of long-term happiness. – Don’t just make the safe and easy choices because you’re afraid of what might happen; if you do, nothing good will ever happen. You can be comfortable or courageous, but rarely both at once. Remember this… remember to stretch yourself in the right direction, one tiny step at a time. Don’t let fear and complacency decide your fate. Quit talking about what you want to do and begin doing it. Laziness may appear attractive, but meaningful work leads to happiness. 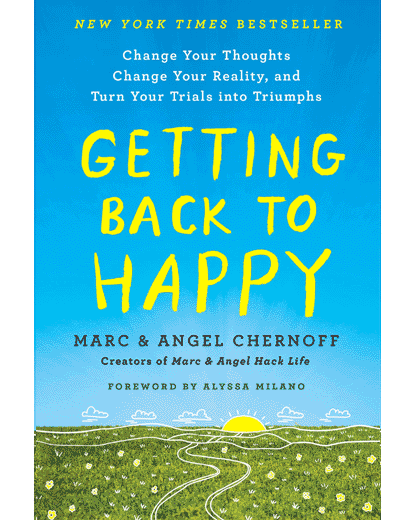 That’s a simple question Angel and I challenge our course students and live seminar attendees to ask themselves anytime they feel unhappiness washing over them. Unhappiness is very often a sign that we’re too busy doing the wrong things. And make no mistake about it, this kind of busyness is a widespread, modern-day sickness! We fill our calendars and our social media feeds with all kinds of busyness, oftentimes just to avoid being still… to avoid being exactly who we are, exactly where we are. The instant we feel a bit idle, we run off in the direction of the nearest shiny object that catches our attention. And in the process, we not only miss out on the serenity and beauty that exists within ourselves, but we also miss out on experiencing that same serenity and beauty in the environment around us. Our busyness has blinded us with “hurry” and “worry,” and the endless need to be somewhere else, doing something else, as fast as possible. And that’s the real tragedy of it: we confuse being busy with being effective. We feel a day late and a buck short across the board, because our daily efforts are completely misaligned with our priorities. But it doesn’t have to. Not any more. Right now, we can slow down and face the truth. Which of the points mentioned above do you sometimes struggle with? How have you coped? What other truths have you learned and accepted that have helped you find happiness? Leave a reply below and share your thoughts and insights. Also, our next annual Think Better, Live Better seminar is taking place February 18-19, 2017. You can get info and tickets here (discounted early bird tickets are now available, while they last). Note: you can watch short clips from our 2016 event here and here. Your second point about needing less to be happy really speaks to me. I’m the king of covering up the sad and broken parts of my life with new shiny objects that distract me temporarily. Rather than facing my issues so I can grow, I subconsciously run away. At least that was the old me. But no more! Thank you for another reminder I truly needed to read. Also, I’m going to look into attending your live event in February with a friend. It sounds wonderful. This entire article/post was dead on! Looking forward to seeing you in February, Paul. Focusing on the wrong things–I’m certain that’s one of the biggest detriments to the vast majority of us. We focus on the negativity, on the drama, and on everyone else’s problems…instead of simply being grateful for what we have in the present and making the most of it. I know I’ve focused on the negativity and drama far too many times in my own life. And although I’ve been reading your blog’s emails and book and making significant progress, it’s a journey I’m still on. But the small positive steps I’m making keep adding up, and for that I am grateful. Your thoughts about close negative relationships is spot on! It stings and yet rings so true in my life. I have a very toxic family member who used to drag me down to my knees (for years). Through your course and coaching I’ve learned how to better handle the relationship. It’s not someone I can just exile from my life, so it’s been tough, but it’s made me stronger. I’m finally getting better at not taking things personally, and at detaching myself from this family member’s behaviors. Doing this has undoubtedly made me a much happier and more effective version of myself. Agreed. Not taking things personally is inner freedom. I agree that most part people look at you and you think to live in their eyes causes you to worry. But if you live to do things that make you happy they can’t be your friend or family. Let it go. The past will hold you back and wastes energy that could otherwise be used for positive happiness. Reading this article makes my soul sing!! As part of my job I often have to tell people what I like to do in my spare time. The other day I realised the very thing that I love (sewing) I never have (or make) time to do, so quit talking about what you want to do and begin doing it needs to be my daily reminder 🙂 I bought both my daughters your book and love sharing your inspiring articles – thank you so much and keep up the great work. I read your posts each time you publish them. They’re sinking in slowly but surely. Teaching me to grow in myself in ways I’ve not contemplated prior. While I’m not happy all the time, I am happy more of the time. Thank you and keep’em coming! Thank you for this gem. It is spot on and helps comfort the soul, who is going forward away from toxic obligations/people, to release guilt/anxiety about those choices. I struggle often with worry and I have a difficult time enjoying the current moment. I always was the bread winner in my family, I had a successful career but I really never enjoyed what I was doing. Once I had my son 3 years ago, I decided to leave my position and stay home with my son because my husband got a great job and was traveling often for work and we wanted to be together while raising our son. Although, I am very grateful that we are together as a family, I feel like time is passing quickly. I am always worried that I am wasting my potential and I’m not sure if I am doing the right thing by staying home, and often feel helpless with helping my family. I am thinking about going back to school to pursue a career in nursing but it feels overwhelming. I am going to try and enjoy more of the present moment and not worry as much. Thank you for the message this morning. Reminds me of how precious life is and enjoy all of your blessings including spending this special time with my son. I spent some of the best years of my life, as a “stay at home Mom.” I never regretted the time that I spent with my children. If I had a chance to do it over, I would have stayed at home with my children and made sure that I also took some special time for myself ! I felt a little lost, once they grew up and became independent capable adults!! I had to re-discover myself as a person! It was a little hard to let go, but everything is good now!!! ( Just temember that you are a person too….!! Alicia, I know this is something many of us struggle with — finding the right balance between presence with family and contribution. Just take it one day at a time. Be present. Appreciate your moments. And gradually explore your options. I have discovered that people will try to push me into doing something because it is something THEY would enjoy doing, so they assume I would enjoy it also. When I don’t comply they are disappointed, and sometimes express it in an unkind way. I spent a lot of years trying to please others, but not only did I fail to please them, I was not happy with myself either. These days I do what I choose to do. Life has never been so good. Sure, sometimes well meaning people don’t like it, but now it is their problem, not mine. Point #5 seems to be my most major obstacle. And with it #6 then is a close companion. Once I get even a smidgen of a positive reaction from someone…my mind immediately leaps to a picture of fulfilling relationship. Of course, I know…intellectually…that isn’t going to happen. Once its over, however brief the encounter, that obstacle just ‘appears’ and I find myself reliving and reliving everything I (think) I did wrong and if only I could get a second chance. Meanwhile the beauty of ‘now’ is indeed passing by. Your words are encouraging…now if I can just make them happen. All this fits me to a tea. This is exactly how a I am. This is what I have been fighting for a long time. I feel so confused. I think of everyway possible to make me get better only to find myself unhappy. Any input might help. Brenda I am with you. Health issues bringing me down and leading to negativity with all other things going on. Not being able to physically do things without pain and tears. Truly awesome and well written, Marc. Thanks. I needed this reminder to start my week! Thank you for your words. I try to focus on the positive but am having a hard time some days. I had been in a long term relationship that ended 4 years ago and dealt with that and was able to recover. A year ago I met someone else and thought my life was changing for the better. That short term relationship ended after I found out I was being used and the person was still in a previous relationship. Now this year, I have retired. It was my choice and I dont regret doing it. However, I find myself very sad and lonely at times. This is not what I had expected retirement to be. I have friends and family who have retired recently as well and am enjoying it immensely. I have a good support from my family and friends but I still have too many days when I just feel sad. I read these blogs and can relate. I know I am blessed in more ways than not, but just need to know what else I can do. Maybe just writing this here will help. #7 making the safe and easy choices. I’ve done this all my life as not to ruffle feathers or come up a loser. I’ve only done the minimal knowing it was possible to do no matter what. I’ve been living in a bubble far too long afraid to take big risk and step to the plate. It was my mother. I finally told her no more-I’m done. I don’t see her anymore and the healing began. But it was hard ~ guilt. Getting over that. Well done. Just had to do the same thing with my daughter. It’s the guilt, isn’t it? Thing is, in my opinion, a bit of time apart (even if that amounts to years) helps you to get yourself together. Then if you want any kind of relationship with them, you are strong and have a direction. Thinking of you and all others that are getting to the healing. These points certainly resonate with me. I retired from the military after thirty plus years, settled in an out of the way place where I know no one and see no one (apart from my dog and my wife.) I am lonely and miserable much of the time, but cannot see how to fix it. I am happy when I hike – I seem to find some purpose then – but I cannot do that every day (my knees wouldn’t cope!) And of course if anyone asks me how I am, I smile and tell them I’m fine, that I’m living the dream… though it’s really a bit of a nightmare! Thanks. Your points are great and that reminds us that you won’t believe that a song is beautiful until it catches your mood. You are great. I’m 74, and I’m in good health, enjoying my life. I wasn’t always positive, but I read your articles, when I get up in the morning I’m thankful for everything that I have. It starts my day on a positive note that carries through the whole day. Thank you for being there. Thank you for continuing to publish these posts outside of your courses – they’re extraordinarily helpful gems that can be applied to almost every day. Thank you for this helpful article! I’ve enjoyed reading your articles for the past 2 years, however this one speaks to me especially. I had relatively major surgery 9 days ago and will be off work for at least 6 weeks. As a doctor myself, it’s the first time in over 10 years that I’ve truly stopped. It’s amazing how we fill our lives with distractions (work, social media, social gatherings, meaningless busyness). Suddenly I’m alone with my thoughts. In the discomfort of it, I’ve found myself mindlessly scrolling through social media, online shopping, news apps etc – anything to avoid my own company! Or when I have been lost in my thoughts, I’ve found it easy to focus on past negativities, feel sorry for myself or imagine future catastrophes. Your article has challenged me to focus on the right things, to let go of my expectations of where I should be right now, and make a choice to respond to my present circumstances with the right attitude. Thank you. My opinion is that people who surround us have a great impact on our lives and our happiness. But other people’s ‘narrow’ opinions that differ from ours are not the problem. The problem is, their opinion matters to us. By prioritizing their opinions we are closing the door that lead us towards a happy life.